The MRC-Georgia class canal boats. 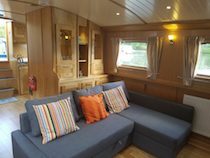 Georgia is a luxury brand new wide beam boat with a modern and fresh feel, whilst still retaining the quaint charm of an English canal boat. 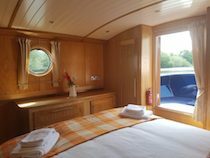 The seating on the front deck allows you to eat outside and enjoy the stunning scenery while on your boating holiday on River Thames. There is central heating via radiators which keeps you warm and cosy in the cooler months. Wifi on board. A sim card can be purchased at booking for Â£20.00 giving 2gb of data. This can be taken home with you afterwards. The saloon has a Flat screen TV, DVD and CD entertainment systems for your pleasure. Two free standing sofas which both convert to double beds if required. Attractive log fuel stove . 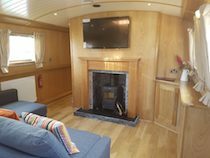 The galley has a full-size fridge, hob and oven/grill and microwave oven. Sufficient crockery, cutlery, glasses, pots & pans etc. for 8 guests. One full bathroom with a shower, flush toilet and wash basin. 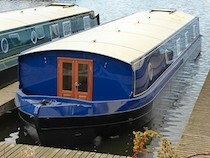 There is also an en-suite toilet and wash basin for the mid cabin.